You go to church, and you hear a message. Sometimes, you hear that everything you are doing is wrong, sinful. The message makes you feel bad. You say to yourself, "I thought I was here to 'hear' the good news". Worse, watch Fox News or MSNBC, and you'll see an endless array of folks telling everybody what they are going wrong. The same thing happens in our industry ... trade journalists, bloggers (me included), consultants, vendors, conference organizers ... all telling you what you do wrong, telling you that your business model is "dead". Sometimes the messages are depressing. So today, let's talk about what you are doing right. There's a TON of things you do well. You have mastered structure and discipline. Catalogs are planned six to nine months in advance. So many business leaders are out there making it up on the fly. You don't do that. Your planning process causes young employees to think. Do you understand how important "thinking" is? Thinking is missing today. You require employees to merchandise a spread. This is hard, HARD work. You have to imagine what the customer wants. It's different than imagining a keyword that a customer must type. You have to get the merchandise right. You have to get the creative right. You have to get pricing right. You have to get cross-selling right. All of this must be done on a spread, on two pages. And it is a guess, isn't it? You have data, sure, but you don't know if what you are doing will work or not. You're doing this on faith. You understand the importance of people. For some, it is an algorithmic world ... lines of computer code making decisions. You know the first names of employees in your distribution center. Do you understand how important that is to these hard working individuals? Do you understand how appreciative a call center employee is to keep his job after phone volume drops and you tell him, by name, that he will now be focusing on solving customer service issues via Facebook and/or Twitter? You have vision. Now, the pundits will tell you that you are a cataloger, so you have no vision. That's false. You were the first to embrace "the cloud", right? You moved your customer data to the cloud (think Abacus) more than a decade before it became fashionable to do so. You embraced e-commerce long before retailers did. You were the first to learn that mobile and social don't necessarily work, that those channels are not aligned with the interests of a baby boomer generation closing in on retirement. You stripped a ton of expense out of the p&l statement in the 2008 - 2009 timeframe ... realizing that the world changed and you had to change in order to survive. You understand why businesses succeed. You thoroughly understand why a 40% annual customer retention rate is acceptable as long as you find new customers. You do this in the face of every single marketing expert in the world who tells you that customer loyalty means everything. Customer file dynamics are the foundation of a business, without this foundation, you don't have anything. You understand this fact. You understand the importance of "team". I know this, because when I am meeting with you, you have your VP of Marketing, a Catalog Director and an Online Director, Managers, and Marketing Analysts in the room. Everybody gets to hear what is being said. I've watched as a Marketing Analyst says something that you clearly disagree with, but you let the individual have his/her say, you let the person be heard. We'll go to dinner, and you invite the Marketing Analyst to join us. Do you understand how important that stuff is to a young employee? Your young employees tell me that when you treat them like equal team members, they feel driven to work hard for you, to help you succeed. And many of you share profits with your employees. I know how motivating this was when I worked at Lands' End. You willingly give up profit that you could keep, realizing that you wouldn't have earned it without the hard work of your team. You practice patience. I know this, because I've been in the room when the social media enthusiast or email practitioner communicates how important it is for you to engage with your customers. Instead of judging, like I might, you patiently listen to new ideas, often giving the employee just enough rope to try ideas without hanging herself. When the ideas don't work, you take accountability. When the ideas work, you give credit to the employee. You plant seeds, seeds that bear fruit down the road, often at another company. These aren't attributes you read about, are they? Instead, you're told that there are seven easy steps to business success. Structure. Discipline. People. Vision. Customers. Team. Patience. Maybe those are the seven hard steps to business success. But you have mastered them. That's the good news, folks. There are folks (researchers, trade journalists, vendors, consultants) who tell you that you must be "omnichannel", or you are "dead". Then we have Hennes and Mauritz. Visit their website for a moment ... go ahead, I'll wait ... click here. And yet, somehow, miraculously, they still manage to sell an embarrassingly large amount of merchandise in-stores (250 stores in the US ... something like $8,000,000 sales per store per year, +/-). How could this business open stores in the US and experience a modicum of success and not follow the multi-channel or omnichannel blueprint experts demand of us (no e-commerce, much less m-commerce). Some of you are football fans, so you know the back story behind this image. We seldom get the opportunity to measure the impact of having "the best" employees against having "average" employees. In the past three weeks, the National Football League gave us a rare opportunity to measure the difference. I recall being at Eddie Bauer, in the mid-late 1990. Comp store sales were -20%, month-after-month-after-month. We had a research department within the marketing team. This department noted that customers were dissatisfied with the knowledge of our in-store employees. Coincidentally, we made a conscious decision a year earlier to not offer average to above-average wages. I recall an Executive saying "our average employee is now 30 years old, it's as if our wage structure only attracts young employees". Translation: "It's as if our wage structure only attracts average employees." Our willingness to accept "average" is killing us. We accept average orders ... those generated via 30% off plus free shipping (yes, I got that email today from a company we all know ... too bad that I paid 20% off plus free shipping for an order two weeks ago, how stupid of me). We outsource our database "to the cloud". Yay cloud! We outsource the task of answering a telephone. We transfer our knowledge of our business to "big data" instead of working hard to learn how our business works ourselves. We outsource the labor of assembling garments. We demand that vendors give us their "best deal". We sell our average knowledge as "best practices". We outsource our customer base to co-ops, so that they can sell our customers to our competitors. We outsource the hard work of acquiring a new customer to Google. We use a free tool like Google Analytics instead of investing in the infrastructure necessary to get real answers to real questions, and then we wonder why our poorly paid web analytics professional can't accurately explain why conversion rates are only 4.668% today, instead of 4.812% last year at this time. We only gain marginal marketing knowledge, then we declare that every other form of marketing is "dead". Like Facebook, or F-commerce. Or Twitter. Or Blogs. Or YouTube. Or Content. Or Mobile. Or Search. Or QR codes. Or Widgets. Or Podcasts. Or Email. Or Multichannel. Or Omnichannel. It's all the same thing. We choose to obtain average knowledge in a niche and then try to steamroll anybody in disagreement. Can you explain why we are so willing to lavish Google or Abacus or Facebook with our hard-earned dollars, but we won't pay our own employees a credible wage to do excellent work? We all work with or for companies that happily pay Google+Abacus+Facebook millions of dollars a year, then freeze employee salaries, and get frustrated when they "can't hire qualified candidates". Our willingness to replace greatness with cheaper, "average" solutions needs to change. You wonder if anybody wants to be great anymore? It costs money to be great. The NFL taught us that you cannot plug in average referees as a replacement for great referees. There are two kinds of cannibalization. One is good, the other is the one that we practice all too often. Good cannibalization happens when one channel takes over. For instance, a customer starts purchasing via email, and stops purchasing via catalogs. This is good cannibalization. You stop mailing 12 catalogs a year, you switch down to 3 catalogs a year, you save a bunch of money and the customer buys 1.9 times a year instead of 2.0 times a year. This is a win-win, for you, for your customer. Good cannibalization happens when you deliberately phase out a product in favor of a new product. Think about the transition from iPod to iPhone to iPad. There's a ton of cannibalization here, with the net result being unfettered profit. Bad cannibalization is what we do to a customer all of the time. We mail 18 catalogs a year and we deliver 100 email campaigns a year and we force the customer to take advantage of a discount or promotion via Facebook. At the end of the year, the customer buys 2.1 times instead of 2.0, and the CFO is yelling at the marketing team about an expense structure that is not aligned with sales. We should actively practice good cannibalization. We need to eliminate bad cannibalization. "Your work on Judy, Jennifer, and Jasmine got me to thinking about a few things. Specifically, what happens when Judy stops buying merchandise? I've invested my entire life in the field of Direct Mail. I believe I am an expert in this area. But what do I do when Judy stops buying merchandise? What do I do for a job then?" "Do you think we can convince Jadyn (the 15 year old that will replace Jasmine in a decade) to love Direct Mail the way Judy loves Direct Mail?" Ah! Now we are getting somewhere. Our industry doesn't want to ask hard questions. We need to ask hard questions. I can take us back to Nordstrom, when we decided to kill the catalog. You want to talk about a mass exodus, well, there was a mass exodus. With the catalog gone, the work that people loved to do was also gone. You could make a choice ... you could recalibrate skills to deal with the business as it existed ... you could switch to a new department and start over ... you could leave the company and find a place where the work you loved doing still existed. People pursued every one of those options. We can easily answer the second question. We're not going to train Jadyn to love Direct Mail. And we're not going to train Jasmine to love Direct Mail. In 13 years, Jasmine will be in her prime earning years. Just think what the world will look like in 13 years? Jennifer has already been trained to trust two parties ... Amazon and Google. Judy loves Direct Mail. She has another 5-10 years to spend money. Given that information, how would you answer the first question? Have you ever run a query, within a retail trade area, of how e-commerce customers and retail customers interact with each other? Look at all customers who purchased between September 2010 and August 2011. Within this audience, analyze e-commerce buyers and then retail buyers during the period of September 2011 and August 2012. If customer buys, 50% purchase online. If customer buys, 60% purchase in-store (this means that some buy from both channels, that's why the percentage does not equal 100%). If customer buys, 15% purchase online. If customer buys, 90% purchase in-store. This story comes up, over and over and over again. What does it mean? E-commerce buyers move to stores. In fact, in our example, e-commerce buyers prefer stores over e-commerce in the future. This means your web analytics software application is likely to completely misread the effectiveness of your website. Retail customers have minimal interest in e-commerce. This doesn't mean that retail customer don't like your website, no, it usually means the opposite ... your retail shopper researches online and buys in-store. It is terribly hard to grow a retail website to more than 20% of annual sales when the dynamics look like this (and honestly, they usually look like this). Your "brand" is anchored in the retail experience. In these instances, retail draws customers away from e-commerce. Some retailers know this, they use their website as a customer acquisition tool designed to fuel future retail comp store sales increases. You know, it's odd to write about catalogs to Catalog CEOs. But it is time to do so, because something is in the air these days. Let's address some of the comments I'm hearing. Comment: "We want to start a catalog". Translation: "We want to have fun advertising via print." Not many people want to do the hard work associated with true catalog marketing. Catalog marketing requires a thorough understanding of product productivity, of the behavioral difference between 59 year old women in New Hampshire and 27 year old woman in San Jose. It is hard, HARD work to generate a return on investment in catalog marketing. Few people are salty enough to put in the effort. If you want to see how much effort is really needed to do this well, from scratch, go talk to the folks at Chasing Fireflies. You'll run screaming after seeing how much work it really takes to do this well. Comment: "We want to make a statement". Translation: "We want to win an award and be spoke of kindly on Facebook". Catalogs are not about making a statement, they are about selling merchandise. There's nothing wrong with beautiful imagery, if you have the money to publish beautiful imagery, by all means, have at it. Real cataloger marketing experts fret endlessly about telling a compelling story that causes a customer to buy something. Getting a customer to buy something is a bit of a lost art. Comment: "Our catalog should be part of an integrated, omnichannel experience." Translation: "We just read a research report, and a survey of 88 marketing executives suggested we need an ominchannel catalog experience to be competitive." There is no better way to kill the productivity of any marketing channel than to fully integrate the marketing channel with everything else you do. You homogenize what makes the marketing channel important. Catalogs work among 59 year old women in Vermont. Social Media / Mobile works among 27 year old women in San Jose. You don't force Social Media / Mobile on the 59 year old in Vermont, you don't force the catalog on a 27 year old woman in San Francisco. The sooner everybody learns this lesson, the better off we'll all be. When you try to be all things to all people, you don't stand for anything. If anything, catalog marketing is becoming a niche designed to serve rural baby boomers who are entering retirement. Focus on that audience if you want to start a catalog --- and then, more importantly, find product that resonates with a rural baby boomer entering retirement. Comment: "We need to get our catalog on Catalog Spree, to be competitive." Translation: "We have no idea what the needs of the our customers are on a tablet, so let's just cut and paste marketing efforts". I'm here to tell you that catalogs on an iPad are probably not the future, though I'd be happy to be wrong. A unique form of commerce on a tablet will happen, we just can't envision it yet. Be honest, what problem does a catalog on an iPad solve? How is that experience better than the physical experience of having paper in hand? How is that experience better than e-commerce? Is the tablet user your core buyer --- in other words, is the tablet buyer Judy, 59 years old, living in rural Vermont? By all means, test tablet commerce and collect all of the business intelligence you can, that's a great use of a catalog on an iPad. But it isn't going to be the future. If it were the future, 5% of your annual sales would already be happening on tablet devices, right? What are the comments you are hearing about catalog marketing? Share them in the comments section of this post. ... "Big Data" is going to save the world. And generate profit for your business, the kind of profit that only omnichannel solutions could theoretically generate. "Big Data" will decide who our President will be, it will decide the future of health care, and it will play a crucial role in protecting and/or violating our privacy. There are at least three components to big data these days. Vendors who are offering solutions not all that dissimilar to the solutions offered over the past twenty-five years. Pundits who talk about big data, hoping to garner page views or followers on Twitter. People actually doing amazing work, not talking publicly about "Big Data" (hint, there's many people in this category). If you're in the catalog world, then you've been dealing with "Big Data" for at least fifteen years ... you happily volunteered your most valuable asset (your customer list) to the co-ops. Co-ops are the very definition of big data, they just never called themselves "Big Data". If you're in the online world, then you've been dealing with "Big Data" for more than a decade. Do you have any idea where your retargeting campaigns are being deployed? Big Data is deciding that ... and has been for the past four thousand days. Here are seven "Big Data" themes that are actually recycled and repackaged concepts from the past twenty-five years. You need a new database infrastructure to handle the volume of data. You need to combine data across all channels to obtain a "360 degree" view of the customer. Your database infrastructure needs to be "fast" ... in the parlance of the day, providing results in "real time". You need sophisticated data mining algorithms to find "nuggets of gold" in the data that humans cannot detect. You need ad-hoc query tools that allow all employees to query the database on their own, obtaining their own answers. You will need a testing platform, so that you can "optimize" your business results and become "data driven". You will self-actualize, with business performance at the top of Maslow's Hierarchy of Needs. Now, let's be honest. There is something to "Big Data", it's not a fad, it's the hype that is out of control. You will always need a new database infrastructure, as the volume of data you'll manage will always increase. This hasn't changed in 25 years. We've been combining data from all channels since the advent of e-commerce. The 360 degree view of customers didn't fundamentally change anything, it simply revealed that business is complicated. Database infrastructures have always needed to be fast, going back to SB37 memory errors on IBM mainframe computers running Easytrieve Plus. We've been told for decades that data mining algorithms would find "nuggets of gold" in the data that humans couldn't detect. Remember the Neural Network craze of the early 1990s? How many "nuggets of gold" do you recall unearthing from your exploration of Neural Networks and Genetic Algorithms? A half-dozen in twenty years, if you're lucky? Certainly not a half-dozen a week. 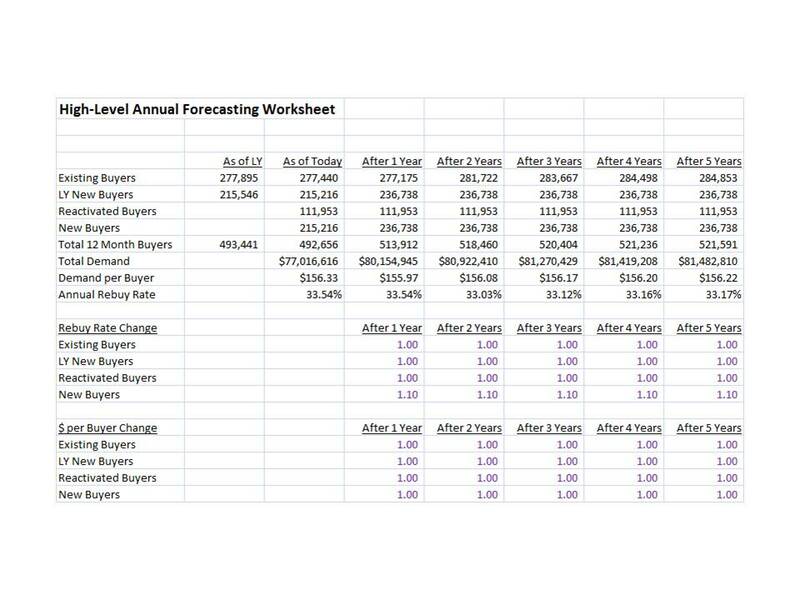 The business intelligence phase of vendor hype gave us ad-hoc query tools (Business Objects, Microstrategy). How many garden-variety, non-data employees used these tools for anything other than producing simple reports? Only a small fraction of employees using web analytics tools ever pushed this front forward. Now, these poor web analytics folks are being told they are "outdated" in a "Big Data" world, so they are rebranding themselves as "digital" analysts. These folks will always be valuable, regardless of the evolution of Big Data. Their smarts matter, folks. Folks have been testing/optimizing for thousands of years. Complex multivariate testing has been documented as far back as the 1930s - 1940s ... Google "Snedecor and Cochrane" for details. You will not self-actualize. If anything, you'll implode. "Big Data" will likely give you insights that are worthwhile, however, you have to pull the rest of your business with you, in the direction you want them to go. Have you ever tried to align the thoughts of 50,000 employees at Nordstrom, for instance? Hint - it's not easy! I'd like to introduce a new concept to you. Let's call it "small data", or as they say on Twitter, #smalldata. "Big Data" seems to be about tools and techniques and data integration and hardware and software and automation and post-CRM theory and real-time analytics and KPIs and reporting. "small data" is all about teaching people what you learn, evangelizing ideas, encouraging employees to be great via information. Is all about analyzing the data you have to make decisions today. Is about the "99%". 99% of the decisions you make on a daily basis have nothing to do with "Big Data". Doesn't require integrated data across all sources compiled in real-time. Can easily be accomplished in Excel. Or Google Analytics. Requires the analyst to be a great communicator. Is about the message, not about the hardware, software, or database platforms. Values and honors "what came before" Big Data. Gladly leverages "Big Data" when appropriate. Go evangelize it ... you use #smalldata every single day ... always have. Remember, yesterday we looked at a business that moved from $77,000,000 to $80,000,000 by somehow increasing customer loyalty by 10% (never mind the fact that if we could increase customer loyalty by 10% we'd already be doing it, because that's a necessary part of our job, right?). Here's the same business, with a 10% increase in new customers. Pretty much the same outcome, right? (By the way, click here to contact me to get a copy of the worksheet). Now, you spend every single day trying to get customers to become more loyal, and you almost never succeed. Ever. Or, you can go out and spend more money, expending almost no work whatsoever, and grow the business by the same amount. Now, this becomes a disease, of course. Just ask any cataloger that is now married to the co-ops. It's a drug that you can't get off of. The secret, of course, is to change the mindset of the organization. If you aren't a ten billion dollar a year company (most of you aren't), then you have an enormous stream of new customers to acquire. New customer acquisition should be like your 401k account, you don't put all of your stock in Microsoft, you diversify. So you should diversify the sources of new customers ... co-ops, paid search, print ads, email, public relations. Each sub-specialty (omnichannel, to use the parlance of the day) serves a purpose, and helps generate new customers. We simply don't think enough about the importance of merchandise. I mean, honestly, what are customers buying from us? Merchandise? So we have to make it easy to a new customer to buy from us. We don't necessarily have to pack 128 pages of merchandise on print, or 4,398 skus all searchable on a website, to get a new customer to buy from us. Maybe we just need one key item, at a great price, with free shipping and free returns ... you know, something to knock down all of the barriers to purchasing. Then, you've acquired the customer, and you test which marketing techniques (catalogs, email, whatever) the customer is receptive to, put the customer in that swim lane, and move on. I've worked with close to 90 companies since founding MineThatData. Maybe 10 of the 90 companies are experiencing breakthrough growth. Almost all of those companies have robust customer acquisition programs, many have iconic items at introductory price points for new customers to try. Below, we can see the forecast for our business, for the next five years. As you can see, there's nothing to be proud about, is there? When I meet with folks, there is a natural instinct for folks to ask "why is this business stuck?" I'll start to explain the reason on two fronts. First, this business has customers who have a 33% chance of buying again in the next twelve months. At this point, somebody raises a hand. "Are you telling me that only 33% of last year's customers purchase again next year?" After I acknowledge the query, the room begins to murmur. "We can fix this. Imagine if 63% of last year's customers purchased again this year? We just need a loyalty program. Let's get busy creating a loyalty program." Let's try something. Let's say that you could invent a loyalty program that worked (never mind the obvious fact that if you could do that, you should have been doing it all along, so why the heck haven't you already initiated a loyalty program that works wonders?). And let's say that you implement the program among existing buyers with long-standing buying history. And let's say that you increase annual repurchase rates among this audience by a whopping 10% (which, by the way, is VERY hard to do ... if it were easy to do, everybody would already be doing it). What impact would this have on the business? You invest all of this effort, all of this money, on your handy-dandy loyalty program. For a year, there's a difference. Sales increase from $77,000,000 to $79,000,000. Then sales plateau at $80,000,000. This is the fundamental problem with customer loyalty programs. They don't fundamentally change the trajectory of a business. In order for loyalty programs to work, you need customers with at least a 60% chance of repurchasing in the next year, customers who will purchase 5-6 times per year. In these situations, loyalty programs tend to perform better, because you are pushing a customer who is likely to buy, and buys 5-6 times a year, toward a scenario where the customer buys 6-7 times a year. But for the rest of us, we have customers with a 25% to 45% chance of buying again in the next year. Pushing this customer to repurchase again is very hard. And even if somebody figures out how to do this, business performance only improves by maybe 5%, on an annual basis. Considering how much you have to spend to make this happen, the end result may not yield a profitable outcome. When you have access to the right data, you can quickly see that loyalty marketing is a challenge. Better to find new customers, than to scream at existing customers to get them to buy again. Speaking of new customers, tomorrow, we'll look at what happens when you focus instead on new customers. I can't tell you how often I hear the phrase "it doesn't work" come up when talking about marketing to prospects. We tried a prospecting catalog, it didn't work. We featured items on the home page to new visitors, it didn't work. New customers / prospects have merchandise preferences that are different. New customers / prospects are in a different need set. Here's an analysis I run for folks. 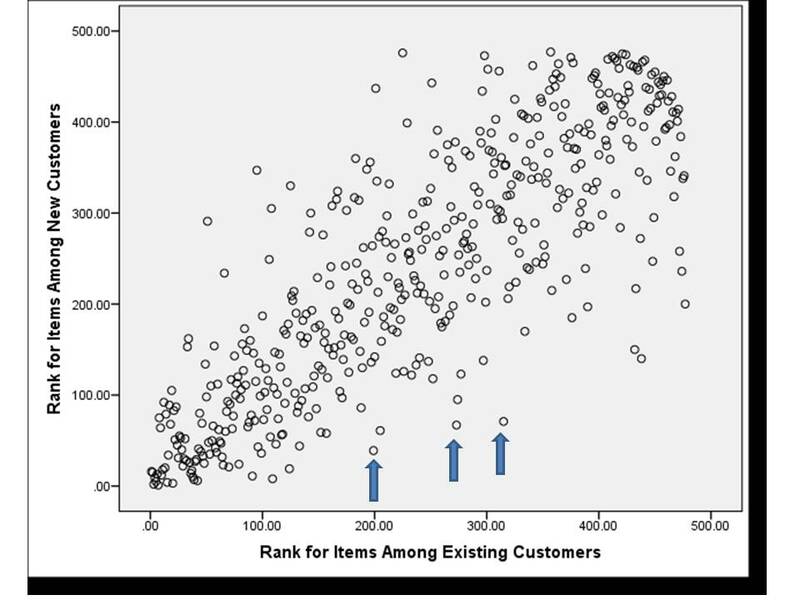 This is a scatter plot of the top 500ish selling items, rank ordered from 1 (best) to 500 (worst) by existing customers and new customers. Look at the arrows. These are items that sell ok among existing customers, but are among the best selling items among new customers / prospects. It's not hard to identify the ten items that sell very well among new customers, but sell average / poorly among existing customers. Find those items! Once you find those items, create a story around them, use those items in your prospecting efforts. This doesn't have to be hard, folks. Now go do it!!!! 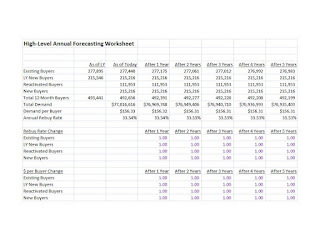 Ok, a quick show of hands ... how many of you have a handy-dandy forecasting worksheet that helps you understand what your business will look like over the next five years, one that incorporates actual customer repurchase rates and spend per buyer? You need something like this, folks. Look at this business. It is stuck. It has a perfect balance of new buyers and existing buyers repurchasing at a rate that yields a business that isn't moving. At all. Ok, a quick show of hands. How many of you have a CEO that sees a business that is forecast to be at $77,000,000 for each of the next five years and is perfectly happy with that? Next week, we'll talk a bit about customer loyalty. My boss at Nordstrom used to say "CRM is a four letter word". Take the University of Maryland. They're having problems getting customers to purchase season tickets to college football games (click here). So you have 15,000 folks who pony up the money for every game. And then the athletic department works with Living Social to offer discounted tickets ... at $15 each. Now, the article doesn't suggest that season ticket holders pay full price for every game, so we can't assume that best customers are being ripped off. Why is it considered a best practice to offer Living Social customers $15 tickets while the general public might be asked to pay $30 or $40 for the same ticket? If you were the marketer who executed this campaign, how would you respond to the customer who purchased a comparable individual game ticket for $40 two weeks before the promotion was offered? Imagine that customer, standing in front of you, asking why s/he had to pay more ... how would you answer that person, in person? Do you think that a partnership with Living Social will yield customers who attend a game, are thoroughly enthralled, and become season ticket holders? On page two of this article (click here), we learn that HauteLook generates anywhere between 25% and 40% of visits from mobile devices, catering to a 30 year old customer. And then we have the typical catalog brand, generating between 1% and 5% of visits from mobile devices, catering to a 59 year old customer. It's becoming quite obvious, now. Yes, a 59 year old customer will buy off of an Android device, and yes, a 27 year old will shop a catalog. But by and large, there are significant generational differences, differences that are exaggerating as time goes by. In the old CRM days, pundits suggested you hire managers to manage different customer segments. Today, it makes a lot of sense to hire managers who are responsible for Judy, Jennifer, and Jasmine, crafting marketing strategies unique to each persona. If your customer is Jasmine, and you're not folding mobile/social into the mix, yes, you'll struggle with this customer. If your customer is Judy, and you're not folding mobile/social into the mix, well, Judy may never notice the difference. Dr. Gene Feldman: On our YouTube channel, I envision Colbie Caillat singing an acoustic version of "Brighter Than The Sun". Except, everybody in this video is wearing Gliebers Dresses. Think of all of the new customers we'd acquire, the brand exposure? Now, watch the TV commercial (also available on YouTube) from Chicos, published on YouTube on August 13. See if you recognize the song (hint, it's 'Brighter Than The Sun' by Colbie Calliat). I know, it takes some planning to pull things off quickly in the real world, but it is fun to dream about the connection, isn't it? There have been many, many interesting questions over the past few weeks. Let's address some of your questions. Question: You frequently talk about Judy, Jennifer, and Jasmine. Sometimes you talk about Jadyn, a future customer who is currently 10-15 years old. Do you think we can train Jadyn to love direct mail the way we love direct mail? Well, maybe. What do you think the probability of a younger customer falling in love with direct mail is? Be honest! We know that when Jasmine was 10-15 years old, we couldn't possibly have imagined that she would be using Facebook and Twitter and Pinterest ... for they didn't even exist when she was 10-15 years old. So we can't possibly forecast what Jadyn will do, nobody can. But we can probably surmise that her future is more closely aligned with modern technology. Question: I love direct mail, but your constant discussions about Judy, Jennifer, and Jasmine suggest that there is a limited window of opportunity for direct mail professionals. This has significant implications for my career. It almost suggests that there is a limited window of opportunity for my career aspirations, as well. What will happen to me? Oh boy. You know, I see the world the way I see it because I perform what are called "annual analytics". I analyze how customers are evolving and changing over the past five years. This allows me to see things that folks who analyze marketing campaigns never get to see. I can clearly see a shift. Jennifer is aligned with Amazon, discounts, promotions, that kind of thing. Jasmine is clearly not direct mail responsive, though there are always exceptions. What I have learned is that there is a lot of sand to play in, when it comes to the "how is the customer transitioning" realm. I've learned that more people want you to explain how the transition is happening than people who want you to learn all of the skills that are currently being learned by modern, younger marketers. Find a reason to be relevant. Question: Why do you talk so much about merchandise? I recently told somebody that merchandise analysis is a lost art. I sat in meetings at Lands' End in the early 1990s, where we put each spread in a catalog up on the wall, color codes ... Gold (30%+ profit rate), Green (20% - 29% profit rate), Blue (10% - 19% profit rate), and Red (< 10% profit rate). Marketers, Merchants, Inventory Leaders, and Creative Staffers were all in on the discussion. The transition to e-commerce eliminated this level of rigor. Oh, sure, we can easily use a heat map to show what customers clicked on, but that doesn't tell us what drives our business. Show me a heat map that links customer behavior to company profitability ... go ahead, I'll sit here and wait while you find a link on the internet to such a map. Merchandise productivity is the secret sauce that fuels our businesses. 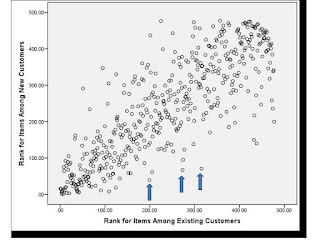 Analyzing merchandise productivity should be the top priority of marketers/analysts. Question: Why are you so devoted to new customer acquisition? Everybody knows it costs eight times as much to acquire a new customer as it costs to retain an existing customer. Why not focus on keeping loyal customers? I've worked with more than eight-five companies since starting MineThatData in early 2007. I can point to clients who increased sales by close to 50% within twelve month by focusing on profitable new customer acquisition programs. I can point to clients who increased sales by close to 20% by focusing on merchandise productivity. I cannot point to one client who increased sales by focusing on customer loyalty programs. You can always improve customer loyalty within the context of a campaign. Unfortunately, campaigns simply shift demand, they seldom create a lasting impact on annual retention rates, orders per buyer, items per order, or price per item purchased. Question: You don't share the same marketing attribution reasoning that other share. Why is that? Don't you think that attribution is really, REALLY important? Well, sure, it is important. But how many attribution practitioners utilize mail/holdout tests? If you don't know the percentage of sales that happen with no marketing, then all of your attribution work is simply wrong. When I review attribution work, almost all of it is simply wrong. Question: What is the next big idea? I keep attending conferences and reading the trade journals, and nothing gains traction anymore, meaning nothing new causes a 30% jump in annual net sales. What is the next big idea? I think it is time for you to invent the next big idea! Why do we keep waiting for others to take risks, so that we can copy their successes? I recently met with a guy who grew his business from $0 to around $2,000,000 in annual sales in just a couple of years, by doing things I haven't seen before. He copied things other people are doing, then just put his own twist on things and created something unique and different. I'm not confident there are any big ideas left in catalog marketing, there's mostly discipline that most of us choose to ignore ... if we chose to have discipline around catalog marketing, we'd increase sales and profit immediately, and we could use that profit to invest in creating the next big idea. I've yet to work with a catalog marketer that takes profit from catalog marketing, and reinvests it in search of the next "big idea". Ok, your turn. What questions do you have? The parallels between books, bookstores, and catalogs are significant. So take fifty minutes this weekend, and watch this session that was recently broadcast on BookTV, titled "The Future of the Book and Bookstore". This is fifty minutes of absolutely riveting television, seriously! Boring setting, riveting topic. Look at the average age of the panelists who are defending the status quo (Judy). Look at the average age of the folks in the audience (Judy). Listen to the questions and comments of audience members. Listen to some of the anger toward Amazon; eBooks and Kindle and newer technology. Listen to the positive comments about paper, about touching, about discovery. Listen to folks decry that money can't be made as easily in a digital format. Think about how all of these folks want to continue to profit off of the author, not really addressing what is best for the author, but instead, what is best for them. Identify the many ways this panel describes how the status quo can compete against a digital revolution in books. Now, take a few minutes, and consider your plight in retail or catalog marketing. Do you use the same arguments that are used in this discussion? How do your arguments stand up, after hearing a comparable argument in a comparable industry? How is your industry similar or different to the book industry? Last week, I took part in a fantasy football draft. For the next fourteen weeks, my attention is focused on maximizing the value of Larry Fitzgerald and Calvin Johnson. If direct marketing held a fantasy draft, we'd have to evaluate each channel, predicting just how important it would be during the Fall/Winter season of 2012. Let's handicap the race, right here, right now. Email Marketing: Email marketing is a lot like drafting a kicker, in that you get credit for a lot of extra points, but you are not going to get a four touchdown day. The DMA loves publishing how email marketing has the best ROI in all of marketing. That's true. Email marketing essentially has no cost, so when you generate $0.09 per campaign, you get $0.03 of profit divided by $0.003 of cost, yielding a 100 to 1 ROI. And yet, nobody talks about how you only get $0.09 demand per campaign, do they? Draft email marketing in the later rounds. Affiliate Marketing: Sometimes known as "the place the customer goes to get a discount marketing channel", affiliates are a lot like drafting backup tight ends. You need a backup tight end for the bye week when your starter isn't available. Similarly, you need affiliate marketing for the small percentage of customers who care more about your promotions than your brand. Natural / Organic Search: This is one of those situations where you wait until after the first week of the season. At that time, you look for a wide receiver that nobody drafted, one that scored two touchdowns in the season opener. You claim this player on waivers, essentially costing you nothing. That's the role of natural / organic search, largely ignored until the CFO wants free marketing. Paid Search: A lot like drafting a starting running back. You have to have a running back on your team, but running backs used to be important and now are not valued nearly has high as are other positions. Paid search was so important from 2004 - 2009. Today, it may be important, but nobody cares anymore, it's like catalog marketing. Omnichannel Marketing: From what you read, this is like drafting Aaron Rodgers or Drew Brees. You HAVE TO DO IT, OR YOUR BUSINESS MODEL WILL BE DEAD. 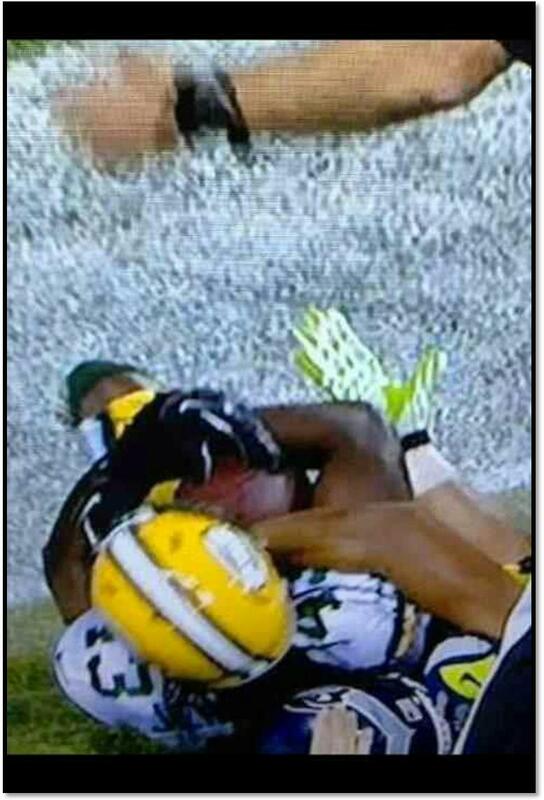 However, Aaron Rodgers and Drew Brees have proven that they work. Omnichannel Marketing is just a theory. Your peers will take Omnichannel Marketing early in the draft. Hold on, and take Omnichannel Marketing in the later rounds. Merchandise: This should be your first-round draft choice. Here's a funny thing about merchandise. If you have crappy merchandise, everything else you do is utterly feckless. Ever visit a company that is failing? Everybody is yelling at the marketing team to do a better job ... you look at the marketing data, and you can just tell that nobody wants to buy the merchandise. Merchandise is Aaron Rodgers or Drew Brees. John Clayton of ESPN did research that showed that teams with a top-12 quarterback have an 80% chance of beating teams with a 13-32nd ranked quarterback. The same thing goes for merchandise. If your merchandise is craved by customers, you have a very high chance of beating the competition. Sometimes, it's as if almost nothing else matters. Catalogs: Unless you're marketing to a 55+ rural crowd, view catalog marketing much the same way you'd view drafting Carson Palmer as a starting quarterback. Social Media: Unless you're marketing to a 30 or under crowd, view social media much the same way you'd view drafting Carson Palmer as a starting quarterback. Mobile: Mobile is like drafting Cam Newton, Josh Freeman, Robert Griffin III ... they are all mobile quarterbacks, and can elude the pocket (i.e. old school marketing), making plays on the run. Of course, mobile quarterbacks sometimes get hit, and when they get hit, they get hurt, costing your team wins. This is what mobile marketing is all about, folks. Your fancy iPad app allows you to escape marketing clutter, but when nobody downloads the app, it's like you just sustained an injury, in that you lost out on opportunity cost to existing channels with proven ROI. Not worth a 1st, 2nd, or 3rd round draft choice, but something you need to keep an eye on. Retail: Retail is a lot like drafting Larry Fitzgerald. He's going to produce, but in an auction league, his cost is very high because he's going to produce. In retail, the cost is very high ... debt, debt, debt. If you invest here, you may not have as much money to invest in other opportunities. Creative: Creative is like choosing a defense. The best defenses have all of the fundamentals covered, allowing them to take calculated risks that result in touchdowns. The best companies know every aspect about selling, they know to present merchandise in stacks or on models, and they know what colors to feature. This allows them to take risks within the confines of the fundamentals they have mastered. Creative isn't something that you'd draft in the top-5, but you clearly want great creative somewhere down the road. Customer Service: So important. Draft it early, at any cost. Free Shipping: Almost expected now. No sense forcing some customers to pay for it to fund the ones smart enough to find an affiliate marketing code. Find the AOV hurdle that makes sense and just do it --- a 3rd or 4th round draft choice, it's that important these days. 20% Off Promotions: This is the Terrell Owens of marketing ploys. In his prime, he was very talented, worth a 1st round draft choice. But then he'd pull out a Sharpie after scoring a touchdown and, well, that's not part of the team spirit, is it? Eventually, his talent wasn't worth the problems he caused. Same goes for promotions ... they bring in the sales, but eventually, promotions wear out their welcome and you can't sell anything at full price anymore. You'll be tempted to do this, to make it a primary part of your marketing strategy. Honestly, it should be a low round draft choice, at best. Comparison Shopping Engines: Certain ideas are popular at some point in time, then fade in other eras. That's the CSE, folks. Remember how important tight ends were in football? About every 10-15 years, tight ends are in vogue, often in periods when the running game matters. Today, spread offenses demand having five good wide receivers, minimizing the impact of the tight end. Today, your social/mobile strategy gets all of the attention, minimizing the importance of CSEs. Co-Ops: When drafting a fantasy football team, you always pick backup running backs and wide receivers that will become starters when other players get hurt. That's what a co-op is to a cataloger ... ignored when business is good, needed when new customers are required to fuel future growth. Use the comments section to offer your thoughts! Stop Marketing To High Returns Customers! Back in the day (i.e. 1992), I was a Statistical Analyst at Lands' End. I was told to find a way to minimize the impact of returns on the business. The analysis showed that customers who purchased at least three times, and returned at least 60% of their merchandise, were unprofitable. We rolled this program out in 1993. Basically, we stopped mailing customers who returned most of what they purchased. It took a few weeks, but the complaints started to roll in. "I'm a great customer, I deserve a catalog!" Our customer service reps looked at purchase transactions, and agreed. "Kevin, this is a great customer, what the heck are you doing?" Eventually, the complaints were so loud, and in such significant quantity, that we had to relent a bit ... we sent catalogs to customers quarterly instead of monthly. The complaints continued from all corners of the world ... except from the office of the Chief Financial Officer ... those folks thoroughly enjoyed a $1,000,000 increase in annual profit coupled with a 1-2 point drop in the return rate. Today, there is no reason whatsoever to market to customers who return too much merchandise. You have a website that is open 24/7/365, so the customer isn't being cut off from your brand. Take a look at this example ... this is typical. When you stop marketing to this customer, yes, the customer spends less, significantly less. 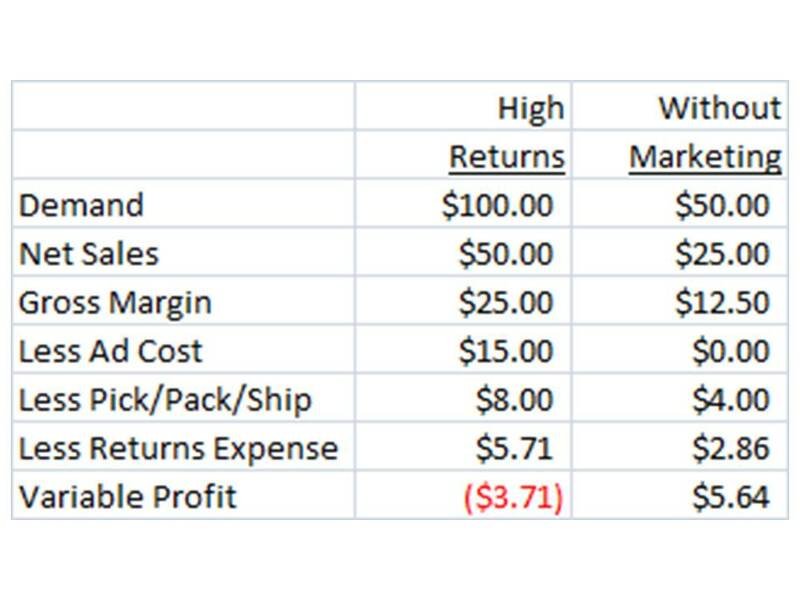 But look at the impact on the profit and loss statement! You can't see this, of course, unless you're willing to do three things. 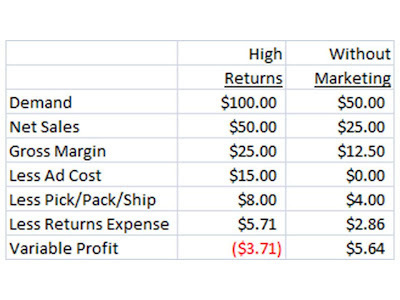 Measure returns on a customer level. Work with your CFO to quantify the actual cost of each item that is returned. Test not mailing customers who return a lot of merchandise. So stop marketing to high returns customers! There's no reason you have to incur losses. The twelve weeks after a first purchase are really, really important. Our instinct, of course, is to get a bunch of catalogs in the hands of a customer who just placed a first order. Our instinct, of course, should be to make sure that everything about this first order went well. We should make sure that the customer feels like s/he was taken care of, and feels satisfied. For many folks, 40% to 50% of all customers who will purchase again do so within the first twelve weeks of a first purchase. For those who were happy with an order, this timeframe is ripe for "add-ons". For those who didn't order the right size, this timeframe is when returns and exchanges happen. Please consider having somebody in your marketing department be responsible for satisfying customers in the twelve weeks following a first order. You might be surprised with the results you get! B2B marketers, typically, are much better at this than are B2C marketers. Maybe it is time all marketers focus on this critical stage in the customer life cycle.